Acer has discovered the opportunity to introduce one unique model to the market to hold their current reputation and here comes the upgraded version of successful model Acer Liquid Jade. Their one and only 64 bit smartphone Liquid Jade S. This device comes under the high end category with a price range around TWD 7000($224). They have decided to supply models on Taiwanese market initially and we can expect the worldwide release soon. Acer is looking for a better market share with their Liquid series. They have also hinted about a Windows based phone in near future and its profit hugely depends on the performance of Liquid series in the market. Liquid Jade S comes with a 5-inch LCD display with full HD support (720 x 1280). The predecessor Liquid Jade has already grabbed the hearts of many with its unique display quality. Display the LCD screen is based on IPS panel and they have also offered the ‘Zero Air Gap’ feature. It is an optical bonding based technology to reduce the air gap between cover glass and the LCD display. This will improve the durability and outdoor display quality under direct sunlight. This enhanced viewability is definitely going to impress lot of customers. The touch panel also enabled with latest Corning Gorilla Glass 3 protection to reduce rough usage. Following the same Dual SIM option of its predecessor there is not much difference with the pixel density (294ppi). There is an unnoticeable change in the overall dimension from the Liquid Jade model and also weights 116 gram. In the case of internal storage and RAM the real upgrade happened from the early model. Acer Liquid Jade S consists of 2 GB RAM and an internal storage capacity of 16 GB as they doubled the efficiency. There is also an expandable storage option up to 32 GB with microSD card. Another interesting inclusion is the 4G support which was absent in the previous version. Moreover phone is based on 64 bit architecture and is the first ever by Acer. Of course high performance can be expected but 64 bit apps are not so popular. Also for the 1.5 GHz Octa core processor higher RAM should have been included. One of the most exciting features of this device is the 13MP rear camera with LED flash. The camera also supports full HD video recording at 30fps which is definitely a good opportunity for the user with a reasonable price range. The same camera configuration is there for the previous model and it proved satisfactory with the image quality. Upgrading to 5 MP from 2MP, they are also moving according to the current trends of a quality front camera. This time they have introduced higher Li-Ion battery of 2300 mAh capacity. But it is non-removable type battery which is one inconvenient trend followed by many mobile manufacturers recently. You can expect better battery backup than Liquid Jade and also the phone supports HTML 5 unlike the early model. 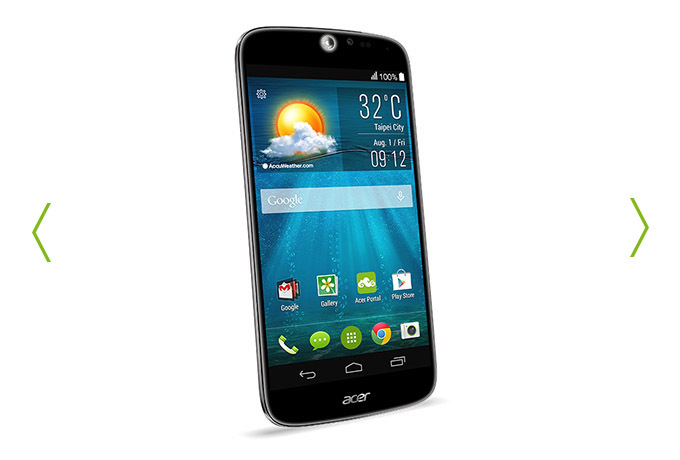 Acer Liquid Jade S is a good upgrade and they are ready enough to keep the momentum of successful Liquid series.